How may Christians better understand the dangers and opportunities offered by the Internet? This excellent resource, written by an expert in the field, explains and illustrates what the technologies are and guides readers to draw on biblical principles (such as self-control and accountability) to help them to apply these to the dangers at hand. It also encourages believers to make the best use of opportunities that arise from judicious use of the World Wide Web. This excellent little book should be in every Christian home. Christians would also do well to share copies with their unbelieving friends. David Clark masterfully takes us through the various aspects of the bewildering world of Internet technology, shows the dangers associated with each, and gives commonsense advice for avoiding those dangers. His ‘Five Principles to Learn From’ and ‘Five Principles to Run With’ (chapters 11 and 12) provide extremely valuable ways for Christians to get a handle on the Internet. If you or your children use the Internet, buy and use this book! David Clark combines his expert technical knowledge of the field with a sensitive use of biblical principles to help us navigate the pitfalls and garner the benefits of the technology which we use every day. The result is a skilful blend of useful information and wise Christian counsel. You, Your Family and the Internet, written by David Clark, is an excellent book. This is a must-read for every Christian; it is a must-read for every parent, and it should be read by every teenager who is being bombarded by the technology of the internet and the mass media. I have reviewed this book, and as a pastor will have my entire congregation read this as a part of their discipleship and Christian growth. Although this book is informative, practical, and encouraging, it also serves as a warning of the dangers that lurk in the murky modern world of computers and the Internet. David Clark points out the many benefits and blessings of the internet, but also educates his readers of the realities of its dangers. The book discusses such topics as internet browsing, Facebook, Twitter, internet games and many other relevant subjects. I highly recommend this book as a helpful tool for parents and pastors alike to enable them to disciple their families and their churches. It is true that the Internet has brought all the world into our homes. This includes good and evil, beauty and ugliness, truth and falsehood. How are Christian parents to deal with this onslaught on our homes and our children? David Clark has provided a much-needed service to the church by writing a book on this very issue. He takes a very balanced approach, and one that is needed in the church. I can’t think of a more pressing issue for the church to deal with. I encourage every parent to buy this book and to work through it diligently. Do not be caught unawares! However you view the new social media--whether as baneful blight or abounding blessing or something in-between--the reality is that these technological developments are here to stay and we, as Christians, need to learn how to navigate in this world. This new book by David Clark, who has a profound knowledge of the realm of computer technology from his work in this sphere and who is also deeply serious about living as a Christian amidst these developments, contains the very sort of guidance we need: realistic and practical and, above all, biblical. I am pleased to recommend David Clark's book You, Your Family and the Internet. Now there is no longer any excuse for ignorance about Facebook, texting and other Internet matters. Every parent must stay as informed as possible about the traps and snares that abound on the Internet, and David speaks clearly to us out of his own experience as a father who raised teenagers. This is a very practical, helpful book that you can begin to apply immediately. Clark has accomplished exactly what he set out to do—provide a practical guide for the proper use of Internet technology. At a little over 100 pages this is an excellent primer to better understand and use the Internet. The book is available directly from Day One Publishing, from any good bookshop or online. 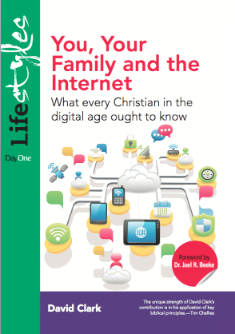 Simply search for "you, your family and the Internet" or the ISBN "9781846253409"
Ebook versions can also be purchased for the Kindle (Amazon Website), and iPad/iPhone (iTunes Website).